*Disclaimer: This post is sponsored by BlogHer & Kettle Brand Chips. I was compensated for creating a summer inspired recipe that pairs with the chips. As always, content, photography & opinions are my own. 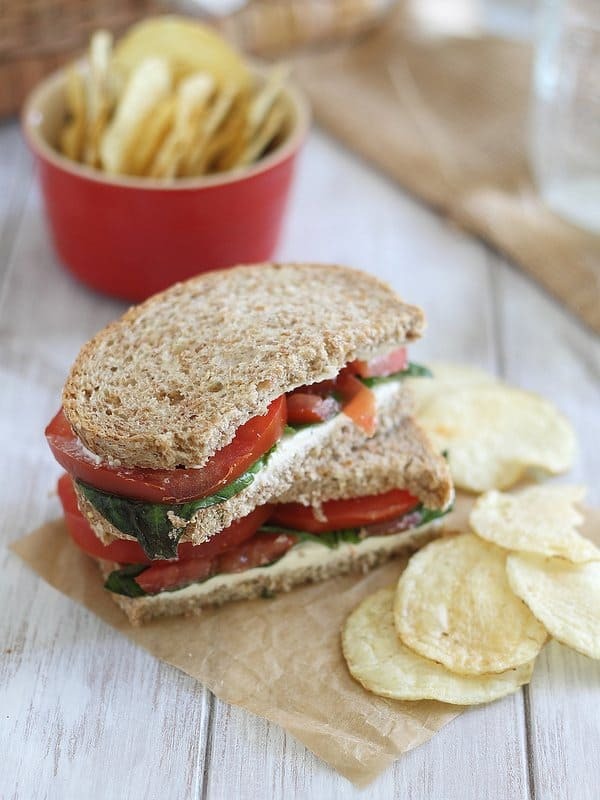 This cream cheese tomato and basil sandwich is the perfect summertime picnic lunch. I grew up a deprived child. My mother hated (and still hates) peanut butter. Do you know what that meant for lunch time in elementary school? No PB&J sandwiches. Ever. Instead, I was the weird kid with cream cheese & jelly sandwiches, on wheat bread and usually with a piece of fruit in my lunchbox instead of whatever cool, highly processed snack was in at the moment. Thanks, mom. Come the summer time though, jelly got replaced with tomatoes and without any lunchtime kids around to judge the weird creation, I openly loved it. I have memories of bare feet, swimming pools, playing soccer in the yard and these sandwiches all woven together somewhere in the back of my head. So when I got the chance to talk about what I pack in my summer time picnic basket with Kettle Brand Chips, this combination was the first thing to come to mind. Except this time, it has an edge of maturity with the addition of basil & balsamic vinegar. In fact, a few weekends ago we decided to take advantage of the state park not even 5 miles from our house that we’ve never been to in the almost 4 years of living here and packed up a quick lunch to eat on the picnic tables there. In my bag, a cream cheese, tomato & basil sandwich. In Ulysses’, a peanut butter & jelly. What I used to wish for as a kid now has nothing on my cream cheese combination, go figure. For Ginger, a lot of pathetic whimpering wishing for a bite of either. And for both of us, a big bag of Sea Salt Kettle Brand Chips. Kettle Brand Chips are one of the few potato chips I’ll actually eat. Why? Simple, they actually taste like potatoes. The Sea Salt are my favorite because the ingredient list has 3 things. A chip whose ingredients you can actually understand. What a novel idea. They were the perfect accompaniment to the cream cheese sandwich with their hint of salt and perfect crunch. Too bad mom didn’t know about these back in the day because I’m pretty sure they would’ve met her “whole” foods/all natural standards for lunch box inclusion. I’m betting the jealousy roles at the lunch table would have been reversed too. Shame I’m in Australia, otherwise I would enter this competition for sure! Sorry, Jan! It’s through Blogher so I don’t have control over that part of it unfortunately. Picnics are the best!!! Especially if you can actually pack everything in a basket and sit on a blanket (as opposed to a park bench and walmart sacks). Heat olive oil in a grill pan (skillet with grill lines, used often to make panini’s) on medium heat. While the skillet is heating, lay the tortilla flat and sprinkle the cheese over the entire thing. Next, place the deli meat throughout the center of the tortilla. Add chopped tomatoes and lettuce along side the chicken. Add a line or two of ranch across the top. Place the tortilla with all of its toppings on the heated pan. When the cheese becomes melted, carefully remove the tortilla and place it on a plate. Once the tortilla has cooled enough for you to touch it, take the bottom end of the tortilla and fold it up about a quarter of the length of the tortilla, followed by rolling one side until you have a “burrito” fold. Place the wrap back on the pan, fold side down, just for a minute or so to ensure the wrap holds closed. Wrap in foil and place in your basket! I have made so many different recipes for these fries trying to find the perfect ones, and I think that I have recently found it! I like my fries to be more on the crispy side as opposed to the soggy or soft side, and this recipe is it! Make sure to wash the grapes before you pack them, and cut your watermelon (cubed watermelon tends to be less messy than slices). Add some lemon, berries, mint, or cucumbers to your water before you head out and by the time you reach your destination your water will be flavourful and refreshing! Nothing tastes better after a morning of hiking the shores of Lake Superior. Pickles, of course. Always pickles! It’s not a picnic without sandwiches and chips! I love to take finger foods on picnics-cheese, crackers, cut up fruit and veggies with a dip. A mini bottle of Korbel…for a fancy picnic! Salt and vinegar chips on my veggie sandwich! Definitely some easily-portable sandwiches (yours look great! ), some fruits, and some chopped up veggies with hummus. I love keeping it simple and healthy! I like to make salads and package them in little chinese food containers. Of course sandwiches and chips are a must. My favorite picnic essentials are sandwiches stuffed with turkey, avocado, mixed greens, and tomato slices! I also love to pack homemade granola bars, apples, and Chobani greek yogurt cups! Water with fresh lemon or lime slices too! My summer picnics are not complete without a huge bag of cherries. We always throw together sandwiches/wraps with whatever veggies we have on hand, but the one constant is popcorn! Sounds silly, but it’s the multi-purpose food – you can eat it and feed it to the ducks! We usually like to take some frozen strawberry lemonade with us, too (TJ’s low cal lemonade blended with frozen strawberries). Super easy! When my friends and I picnic (or tailgate :)), we usually have sandwiches/wraps, veggies and fruit. Oh, and always pirate booty! Pimiento cheese and white wine….kinda want that right now. my lunch basket would include: some sort of sandwich, chips or potato salad. i also like fruit platter. I was the weird lunchbox kid too, but now I love it! I’m all about pairing a wheat cracker, slimwich, etc., laughing cow cheese wedge with tomatoes and a little cracked black pepper on top. Yum! My picnic basket go-tos? Anything you can eat with your hands and without cutting: grape tomatoes, cheese slices, crackers, wine (screw-top! ), sweets! My go to picnic lunch is turkey and avocado sandwiches. We usually do some fresh veggies and either tortilla or potato chips. Kettle Sea Salt potato chips are my favorite too. I love Kettle Chips – love love love their crispyness! No Peanut Butter as a child?!? I am so sorry! My picnic basket actually includes peanut butter… I up the typical PB&J sandwich by grilling it, like a grilled cheese sandwich (usually on the Foreman), so it all stays together and is a little crispy! I would include lemonade and cookies. I always include chips and fresh fruit. Chicken salad sandwiches with grapes, always! My basket would be filled with light, refreshing foods: salad, berries, sparkling lemon water, and some sweet treat! I love any sandwich that involves cream cheese! I did a post for Kettle Chips too and I’m having fun seeing what everyone made! I used to live in Australia and we would always picnic after checking out the amazing farmer’s markets…the typical spread included seasonal fruits, yummy dips–sweet chili apricot was my favorite, and some turkish bread for dipping. i include usually a salad, with some sort of meat, a fun drink like coconut water and some dark chocolate. mhmmm! I always bring fruit salad! Whole wheat bread, thin sliced turkey, lettuce, tomato, mustard, cheddar cheese…. 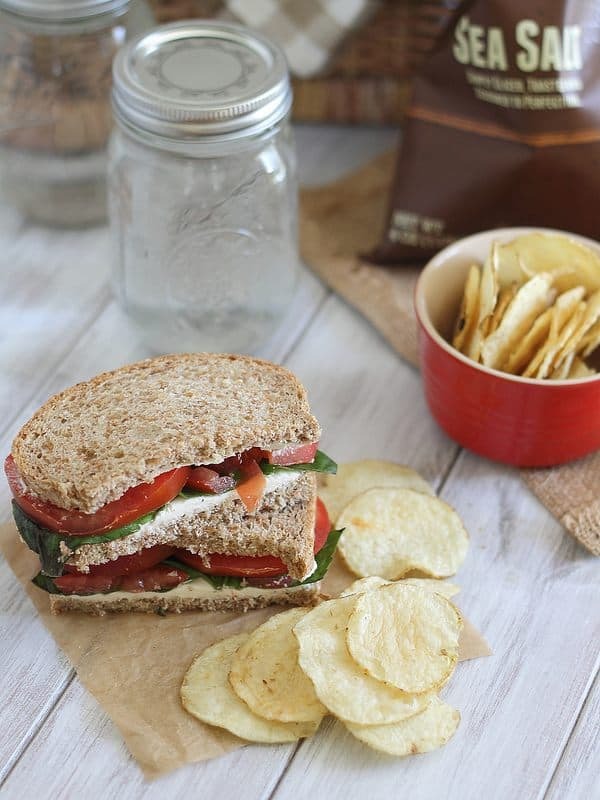 we like to build our sandwiches fresh when we picnic… we do take peanut butter and jelly sandwiches too but they are for dessert :-) sometimes we take chips… I will be sure to try these kettle brand sea salt ones this Sunday. ..and we love to take watermelon too! Love your site! Thanks so much for your personality and your recipes! I always bring lots of water that I flavor myself with limes and lemons, and a whole wheat turkey sandwich with brie! A wrap. One of my favorites from school – I was often kid with weird food, but my friends loved it… they would trade me my real food for their processed food. To this day my favorite wrap is simple… made on a whole wheat tortilla with cream cheese slathered on, then some turkey breast, tomato, romaine, mushrooms, and pickle. hmmm! I’m all about the pressed sandwiches for picnics myself; some crusty bread, a layer of pesto & mayo, boiled potato slices, hardboiled egg slices, tuna, olives, and greens all smushed under a cast-iron skillet for a few hours. Sandwich perfection! Potato chips are a must for any picnic! A fun tradition my parents had (that I hadn’t thought about in ages) was stopping at the grocery deli to get a rotisserie chicken, mashed potatoes and corn for a quick and easy ‘picnic’ that required zero time or clean-up in their kitchen and was so fun to bring to state parks. I keep it simple, bread, cheese, cherry tomatoes if in season, olives, fruit, and cookies. darn I’m canadian and can’t be entered in the draw, but we always had our tomatoes separate from our sandwiches so our bread wouldn’t be soggy by the time we went to eat! I like to have ham and cheese sandwiches, wine, and cookies! I would definitely include some type of raw salad, like a romaine lettuce and celery salad with a vinegar mustard sauce/dressing. Maybe add some strawberries for some sweetness! Picnics always make me long for hanami (flower viewing) picnics in Japan! I’d pack onigiri with various fillings (salmon, umeboshi, bonito flakes), croquettes, rolled egg omelet, and seaweed salad! My picnic basket usually includes different types of cheeses, crackers, and grapes. Cheese and Vino! I even have “Picnic sticks” that hold the bottle and glasses. Can you tell I take my picnicking seriously? I include cheese sandwiches, pretzels, fruit salad and juice drinks. Great looking sandwich! In the summer, when tomatoes actually taste like tomatoes and not cardboard, I love tomato and basil sandwiches! Our picnic basket usually has hummus and veggie sandwiches and some fruit. love a chicken salad for a picnic!! I’d pack sub sandwiches, potato chips and fresh fruit. An assortment of cheeses and meats, fruit, and when I’m feeling fancy, chocolate-dipped bananas (THE.BEST.). I always include fruit and pasta salad! Oooh love this! 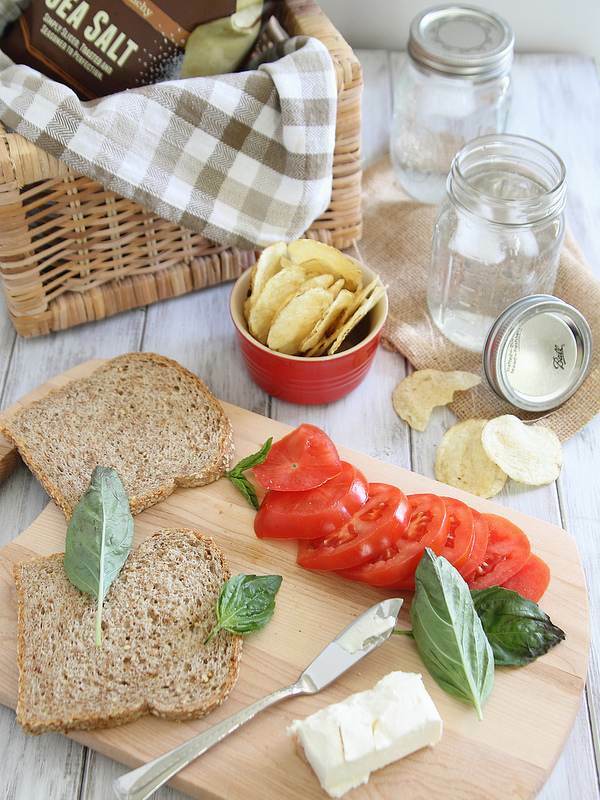 I always have some type of chip/bread and a dip in my picnic basket – it’s the easiest thing to pack and you don’t need utensils! I was a weird kid too! I took that only my sandwich was on white bread. Thanks for the giveaway! I usually pack things for a picnic like cheese, fruit, some type of chips, and water. I’d include italian sub sandwiches cut into small servings, chips, fruit and ice tea. i love sandwiches, nuts, cookies, granola, dried fruit, and some salty chips! Sandwiches or roll-ups, potato salad, fruit, brownies. I have to have bread & butter pickles! Fruit shakes, finger sandwiches, cookies! I include chicken salad sandwiches, fresh strawberries, chocolate milk boxes, and whole wheat crackers with white cheddar cheese! I would pack turkey and cheese sandwiches, fruit and chips. I include sandwiches, Baked Lays, fruit, and cookies! I would bring ham & cheese crackers. I love chicken fingers, BBQ wraps, and we come with lots of water. I would probably go pretty traditional—turkey sandwiches, chips of course, fresh fruit, brownies. Thanks! Sandwiches, chips, and fruit are classics! Egg salad (on toast, in a wrap, or on a bed colorful greens) is ALWAYS a must! I put celery, chopped dill pickles, green onions, avocado (sub for mayo), spicy mustard, pepper, a dash of cumin, and semi hard boiled eggs in it. I could eat this for days. Some nice, juicy watermelon. Delic! My picnic basket would include wine, cheese and crackers. sandwiches, fresh fruit, and fresh veggies! My picnic always has to have cold turkey sandwiches and chips. Classic combo and it hits the spot! My picnic basket has, cold fried chicken, potato salad, cole slaw and wine! I love snacking, so my basket would have different cheeses, olives, dips and a baguette! We always have fruits – apples, bananas, oranges – and cut veggies in our picnic basket! I usually have fixings for subs and a wide variety of drinks in my picnic cooler. Also frozen grapes. Sandwiches, meats, cheeses, fresh fruit, wine, lemonade and dessert! Don’t forget your blanket. I like to include hummus and chips. In our picnic basket – Hummus crackers chips salsa fresh fruit and flavored water. Tea sandwiches, salad, and brownies. I like to have fresh fruit (cantaloupe, grapes, watermelon), along with deli meat and cheese for sandwiches. I like to include simple things that pack well and that most everyone likes, Sandwiches are usually good, chips, and lots of cold drinks. I like the look of your sandwiches; we usually make sandwiches, pack salads, some fruit and always pack chips! Tortilla wraps and lots of fresh fruit and especially watermelon during the Summer! I haven’t had a picnic in a long time, but I always bring sandwiches, chips and cookies. In my picnic basket, I include fresh fruit, crudite & hoummous, prosciutto, sharp cheddar, napkins, cutlery, and WINE!!! We like to take hummus and pita chips on picnics. I include sandwiches (the kids still love pb&j, lucky me! ), chips, fruit and drinks in our picnic basket. Love chilled chicken salad, crusty bread, fruit, and a great bottle of wine minus the ants. Garden veggies if we have them. I love picnics!! I like to add turkey wraps, veggies and dips, cheese, fruit and wine. I like to take assorted sandwiches, fruit salad, potato salad, soda, and Kettle chips! I always pack my picnic with potato chips, fruit, veggies and dip, iced tea and juice, sandwiches or wraps. It’s just so much fun to go on a picnic. We usually pack easy finger foods like muffins, chips, sandwhiches and lots of drinks. Thank you! Chips, watermelon, cupcakes & sparkling water. I always make sure we have watermelon with us. we always have fresh fruit like watermelon and cherries! I always have lots of fresh fruit, subs, and pieces of dark chocolate in my picnic basket. Depends on what’s around the house. I’m a stingy recycler. Perhaps fruits, veggies, something with quinoia and homemade sparkling limeade. I like to put cuban sandwiches and honeydew melon in my basket. I always have potato salad, yum!! We always have sandwiches, fresh fruit, corn on the cob and chips in our picnic basket. I always have sandwiches, fruits and veggies, chips, and potato salad! I always make hummus for our picnics. It tastes great and it good for you too. I make a basic recipe then add jalapenos and roasted pasilla and bell peppers. fresh pita, homemade hummus, lots of dippable fresh veggies, and a big jug of homemade limeade! We love Kettle chips… hubby would make sure they were the first things in the basket! =) Gotta have apples and water too! Sandwiches, fruit salad, chips, dessert, napkins, picnic blanket and drinks. I have sandwiches, chips, cookies, and drinks in my picnic basket. I like to include sandwiches, fresh fruit, drinks, chips, and salad. My family is all about sandwiches so that’s usually what goes in our picnic basket. Fruit juice and plenty of water too! I like to have shrimp cocktail, crusty french bread, brie and grapes or watermelon. One of my family’s favorite foods inside my picnic basket is Chicken and Slaw wraps! They are so easy to make epecially if you use rotisserie chickens. Mix the chicken with some coleslaw, ranch dressing and sweet pickle relish, place on a wrap and roll it. your family will love it! No matter if our picnic is a simple sandwich affair or a gourmet BBQ with skewers of teriyaki steak or chicken, we always include our vintage tablecloths in our picnic basket. I have several wonderful old tablecloths from the 1950s splashed with colorful flowers and designs (and a few indelible stains) that always conjure fond memories and bring back the happy Ghosts of Picnics Past. Turkey sandwich, chips and dip, salad & fruit!